Fairway Solitaire Giveaway Now Live. Enter for a Chance to Win an iPad Mini! Fairway Solitaire is one of the most fun and brilliantly addictive mobile games currently available. Thanks to our friends at Big Fish Games, now is your chance to get your copy for FREE and enter for a chance to win a brand new iPad Mini just in time for the holidays! The catch? There is none and with every participant receiving the full paid version of Fairway Solitaire for free, everyone is a winner! This game normally retails for $0.99 and can be played on any iOS device. Don't own a iPhone or iPad yet and looking to win one here? The holidays are a time for giving, so if you can't use the code, remember that you can always give it to a friend or family member to redeem. 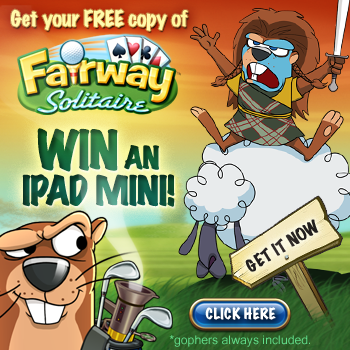 Fairway Solitaire is the much-anticipated sequel and one of the most exciting and addictive card games available includes solitaire hands dealt on more than 350 hand-crafted golf holes, 4 mini games, 32 trophies, a golf shop, golf announcers, hazard cards, and one SERIOUSLY ticked off gopher! Follow this hilariously sarcastic story of the gopher and his seething disdain and desire to put all golfers in their place. From beachside courses where palm trees sway, to the hustle and bustle of illuminated city courses, keep your eye on the prize because there is nowhere this gopher won't follow. Score the best runs by clearing the card deck using the least amount of moves, and don't forget about those mulligans! Whether scoring a double bogey or 3 under par, this hit will have you laughing so loud you'll forget to be quiet on the golf course! For up to the minute information on Fairway Solitaire, you can follow on Facebook here. This event ends on December 15th at 11:59PM EST and is open to most residents of the US, United Kingdom, Ireland, Canada, Germany, France, Italy, Australia, and New Zealand. For all the rules of participation and how to receive the limited edition badge just for participating, click here.